The Preferred Florist Program can help you build stronger relationships with florists in the network. FSN randomly picks a florist in the delivery area. Choose a florist from a list of members in the area. With the preferred florist program, you can mark a florist in a specific city as your preferred florist. The next time you have a delivery going to that city, the order will show you the preferred florist in that area, making it easy for you to select them. The more florists that mark you as their preferred florist, the better chance you have of receiving orders going to your delivery area. Delivery confirmations help create a relationship between sending and receiving florists. the sending florist is notified that the order has been filled and delivered by you. This email also asks them to mark you as their preferred florist. 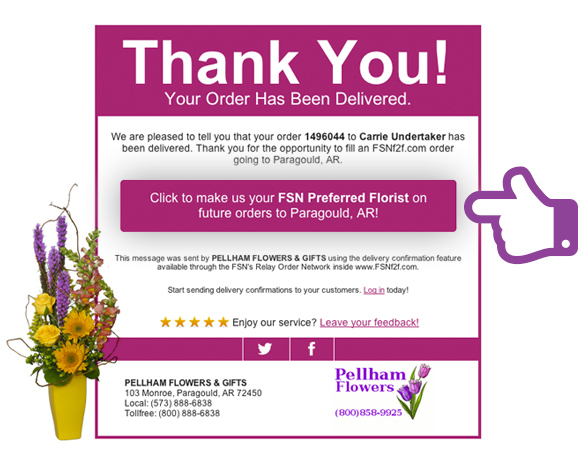 When you confirm deliveries from FSN orders, the sending florist is prompted to add you to their Preferred Florist list. More confirmations = more orders! Show off your beautiful creations to your fellow florists by easily sending photo delivery confirmations. Also a great way to get added as a Preferred Florist! or click here to join online.